Here is another recipe I’ve been meaning to write up for a very long time. Our redcurrants aren’t quite ready to make this ice-cream yet – assuming the birds don’t get there before us! But we do still have some left in the freezer from last year – amazing isn’t it? This no-churn ice-cream is so simple to make it has become a firm favourite and I’ve made several different versions so far. Do have a look at my other ice-cream recipes. This one was sweet, smooth and creamy with lovely bursts of tartness coming through from the fruit. Strangely, it tasted more like raspberries than redcurrants. I am entering this into BSFIC over at Kavey Eats as the theme this month is fruit. This is a super challenge which seems to inspire some fabulous creations. I keep meaning to enter and very rarely manage it, so I’m pleased to be able to do so this time. An easy to make no-churn ice cream using summer redcurrants, although any tart fruit could be used instead. Simmer the red currants in 1 tbsp water until soft then push through a sieve to create a smooth puree. Mix in the vanilla extract. Melt the chocolate in a bowl over hot water. Mix in 100ml of the condensed milk until smooth. Whip the double cream until peaks form. Add the remaining 100ml condensed milk and whip again. Stir in the white chocolate mixture. Fold in the fruit puree to create a ripple effect. Thanks Kate. Ice-cream is just what is needed in this weather – tennis or no tennis 😉 This is a great recipe and the redcurrants can be submitted with raspberries, strawberries or any other summer fruit. This looks so delicious! I could eat ice cream all day! Thank you LL. It’s strange, in the winter I don’t want to eat it at all and in the summer I can’t get enough of it. Wow! Beautiful and so simple. Good to see the weather has turned perfect to enjoy it! Yes, summer at last Kate – hooray! It’s a great recipe and gluten free too. Glorious glorious colours! I’m always so impressed to see the variety of people’s creations! I need to get mine up tonight. Also used the no churn recipe – I love it! Glad I’m in good company Kavey. Love the colours I get from fruit ice-creams. I haven’t made a raspberry one yet though. I’m so going to give that a try! It looks lush! Yes same here Jean. I don’t think I’ve ever seen them for sale. You need to get friendly with a gardening neighbour I reckon! This is something my kids and husband would really like. Do give it a try Sandra – it’s so simple to make and so delicious. If you use raspberries, you don’t even need to cook them – just puree and sieve. I love home made ice cream, great idea to use the redcurrents from the freezer! What a great recipe, I may have to try that with my blackcurrants when they are ready as my ice cream machine packed in (the bowl started to leak blue stuff – eek!) and it’s the third I’ve had which has done the same, so am reluctant to buy another one. 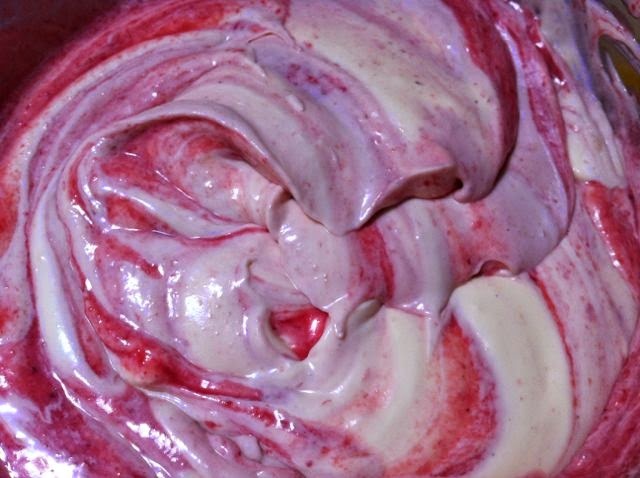 The first one of these types of ice-cream I ever made was with blackcurrants – blackcurrants and rose syrup. The tart currants work so well with this. Recipe is on the blog Janice. Ah, but have you ever had redcurrant ice-cream Fiona? I am a big fan of no-churn ice creams and this one looks delicious Choclette! Thanks Vohn. It’s such a simple recipe, but it gives such good results. 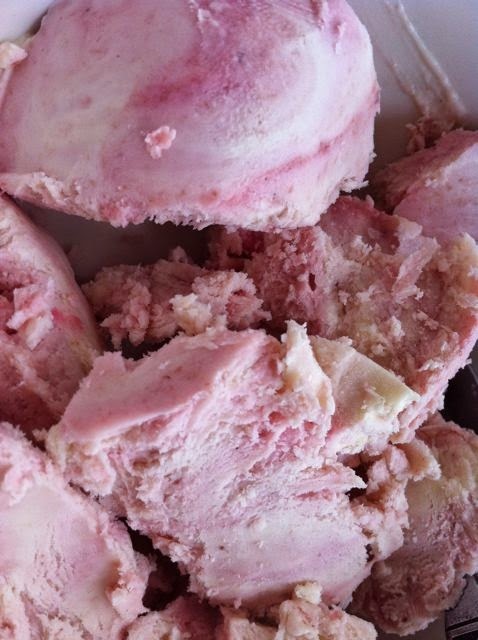 This looks delicious I made asimilar icecream using black cherries,I will try redcurrants next time .I love the colour. Thanks Nayna. Ooh cherries sound wonderful. Now I’m craving cherry ice-cream. Yours is the second no-churn ice cream I’ve seen tonight! I think it’s a sign 🙂 I love the combination of red currants and white chocolate…how delcious! that sounds SO yummy, always have left over berries now i know what to do with them, thank you so much! Glad to have provided some inspiration Stephen. I’m envious of your leftover berries; the birds got all of ours – again!